A partnership between University of Maryland, Baltimore and Guidewell Financial Solutions (also known as Consumer Credit Counseling Service of Maryland and Delaware, Inc.) now provides West Baltimore residents and UMB students, faculty, and staff with financial counseling, housing counseling, and other resources to promote financial awareness and empowerment. University of Maryland, Baltimore (UMB) recently began a partnership with nonprofit Guidewell Financial Solutions (also known as Consumer Credit Counseling Service of Maryland Delaware, Inc.). This joint effort is designed to help campus and local community members to improve their financial well-being by developing practical money management and housing knowledge and skills. This recent partnership is a natural step for Guidewell Financial’s involvement in other University financial stability initiatives. As a UM School of Social Work (SSW) graduate, Guidewell’s Director of Business Development Devon Hyde, MSW, is an active participant in the SSW’s Financial Social Work Initiative (FSWI) and the National Association of Social Workers Maryland Macro Social Work Committee. As part of the expanded partnership, Guidewell Financial now provides free budget and credit counseling at UMB’s Office of Financial Education and Wellness twice a month. This service is available to staff, faculty, and students alike. The office presents periodic Credit Cafés, where Guidewell assists UMB participants to access a free copy of their credit reports and to obtain complimentary credit reviews and individual analyses. Guidewell Financial also delivers services at UMB’s Community Engagement Center in West Baltimore. Once a week, it provides housing counseling and other financial education services. SSW Research Assistant Professor Christine Callahan, PhD, LCSW-C, of the FSWI, says, “I had an opportunity to see first-hand how eager people are to hear about the services Guidewell Financial is offering at the CEC in West Baltimore. These services are critical in promoting greater financial stability and in helping folks work on their financial needs and goals. Bringing Guidewell Financial into UMB's community this way makes it very convenient for residents and is such an exciting step." 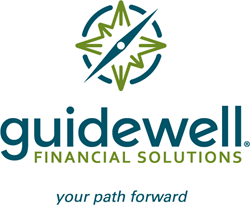 To learn more about Guidewell Financial Solutions’ outreach and services, please visit the agency website at http://www.guidewellfs.org or call 1-800-642-2227 for an appointment.